Almost all states charge parents for the care and support of youth involved with the juvenile justice system, and some states charge juveniles directly. This report documents how and when youth and families face fines, fees and restitution and the economic and legal consequences for failure to pay. The report identifies promising practices, as well as legislative remedies that could be replicated across the country and highlights jurisdictions which have recently stopped imposing court costs, fees, and fines in the juvenile system. These findings and recommendations are based on a review of state laws as well as a national survey of lawyers, adults with previous juvenile justice involvement, and families in 41 states. In Part A, the report provides an overview of the problem: the widespread imposition of costs, fines, fees, and restitution on youth; the significant legal consequences for failure to pay; the financial stress on youth and their families; the unique challenges young people face in attempting to pay fines; and the exacerbation of racial and economic disparities in the juvenile justice system resulting from such financial obligations. In Part B, the report looks in detail at eight types of costs imposed on youth and families: probation/supervision, informal adjustment/diversion, evaluation/testing, cost of care, court costs, fines, expungement costs, and restitution. For each type of cost, the report identifies the states that impose such costs by statute, provides data on how widespread the practice is based on survey responses, and when possible, further illustrates the issue with stories from youth or families. 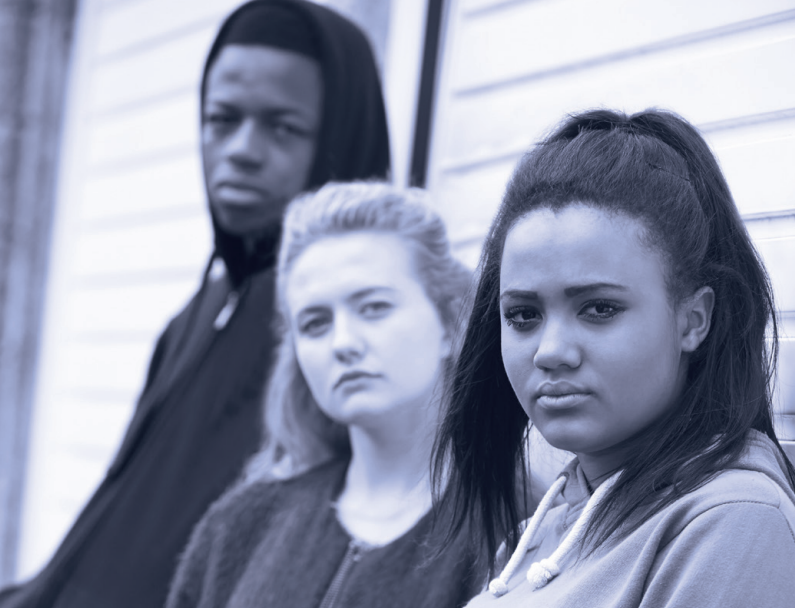 In Part C, the report documents the harms that costs impose on youth living in poverty. For example, youth who can’t pay for diversion programs may enter the juvenile justice system while a wealthier peer would not; may be charged with violations of probation for failure to pay costs; may be unable to expunge a juvenile record because they owe money to the court; and youth or their parents may be held in contempt, incarcerated, or have driver’s licenses suspended for failure to pay. Court costs and fees can also cause families to go into debt and strain family relationships. Children from families living in poverty may face harsher consequences than their more affluent peers, be deprived of diversion programs and rehabilitation options, and be pushed deeper into the juvenile justice system just because they cannot afford to pay court costs, fines, and fees. You can read Debtors’ Prison for Kids? The High Cost of Fines and Fees in the Juvenile Justice System via Juvenile Law Center. Inability to pay for treatment can result in youth being deprived of treatment, held in violation of probation, or extended periods of incarceration. 22 states charge juveniles fees for diversion. Survey respondents in 14 states indicated that inability to pay for diversion sometimes resulted in a formal petition being filed, and respondents in 6 states reported that it resulted in youth being put in juvenile justice placements. 31 states charge fees for evaluation or testing (e.g. DNA, mental health evaluations). Youth and families are assessed fines in 29 states and court fees in 28 states. Youth and families in 20 states reported payment requirements associated with sealing or expungement. Fines or court fees should not be imposed on juveniles. States that do continue to charge fines should consider setting low caps on fines, assessing fines only after a determination of ability pay, allowing youth to participate in community service in lieu of paying a fine, and maintaining a focus on rehabilitation. Fees should not charged fee for participation in diversion programs. If there is a fee, it should be based on determination of ability to pay. Youth should not be denied access to diversion because they cannot pay, and failure to pay should never be grounds for revocation of an informal adjustment agreement. When a juvenile is required to undergo testing, the state or local jurisdiction should pay for the test. Fees should not be charged for sealing or expungement. Improve coordination with health insurance whenever possible to avoid gaps in care and eliminate any charges on parents for cost of care that cannot be covered by insurance. If such costs are imposed, state policy should ensure that a failure to pay does not result in a denial of treatment, a violation of probation, or incarceration.